MILAN METRO LINES - The Milan subway system comprises four lines: M1 (red line), M2 (green line), M3 (yellow line), and M5 (lilac line), in addition to the Milan Passante railway ( Passante ferroviario). Here you can find a Milan metro map with all its lines and stops, as well as interesting information about each line. HOW TO USE THE MILAN METRO - Before getting on the trains, you must validate your ticket or travel card and go through the turnstile. Please pay attention, all tickets must be validate even when leaving the metro stations. 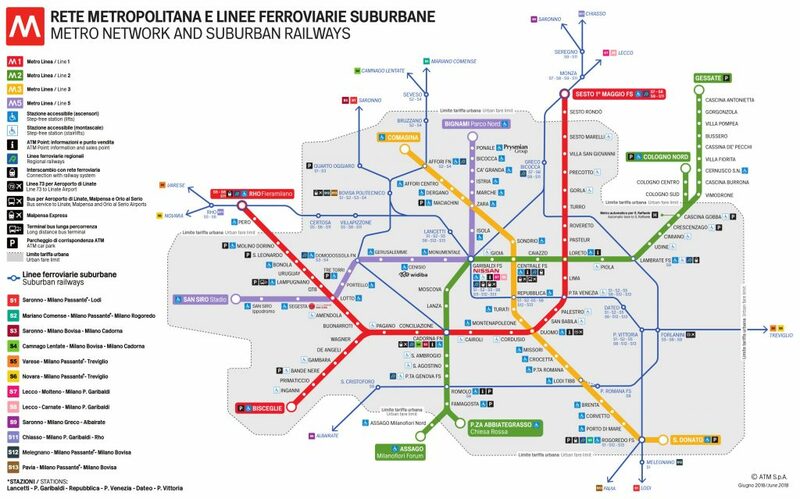 LINE 1 / RED LINE – It is the most important metro line in Milan and it connects its most relevant areas from the city center to the suburban area of the city. This line runs every day from 05.30 a.m. to 00.30 a.m., from north-east to west. On Sundays and on holidays the metro runs from 06.00 a.m. to 00.30 a.m. The most important stops on the red line are Duomo, San Babila, Castello and Cadorna FN. LINE 2 / GREEN LINE – It is the second metro line in Milan and connects some important touristic areas of the city, such as the Navigli area, Moscova, Brera district and Cadorna. It runs every day from 05.30 a.m. to 00.30 a.m., from north-east to south. On Sundays and on holidays the metro runs from 06.00 a.m. to 00.30 a.m.
LINE 3 / YELLOW LINE – This line runs from north to south in a single line. It runs every day from 05.30 a.m. to 00.30 a.m., and on Sundays and on holidays from 06.00 a.m. to 00.30 a.m. The most important stops on this line are Duomo, Montenapoleone, Centrale FS and Porta Romana. LINE 5 / LILAC LINE – The lilac line connects the northern area of Milan with the western area. It runs every day from 05.30 a.m. to 00.30 a.m. On Sundays and on Holiday the metro runs from 06.00 a.m. to 00.30 a.m. The most important stops are Isola (Porta Nuova district), Monumentale, Portello (City Life district) and San Siro. PASSANTE FERROVIARIO (PASSANTE RAILWAY) OR SUBURBAN LINE – It is an underground railway which runs through Milan. It has only 6 main stops in the city, which are Porta Vittoria, Dateo, Repubblica, Porta Venezia, Porta Garibaldi and Domodossola. You can use this line to move in Milan or to reach some cities outside Milan like Como, Varese, Cremona, Lodi etc. LINE 4 / BLUE LINE – This new metro line is under construction and will be ready in 2020.